The Peter Rabbit Storybook Front Cover. (c) Bess Goe Willis. Ryerson University Children’s Literature Archive. Public Domain. The Whimsical World of Peter Rabbit Exhibit examines literary techniques applied by Beatrix Potter to create a world that makes use of anthropomorphism, perennial socially relevant plot points, and a nature based setting to explore the life of Peter Rabbit. The author uses the concept of using innocent beings such as animals to create a connection with an audience in an attempt to introduce the pleasant tone of the world, while making sure that the plot lines taking place are associated with common human behaviors. 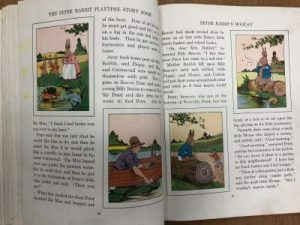 This idea that promotes living vicariously through fictional beings allows for morals to be learned for the reader, while elements such as the size and format of The Peter Rabbit Storybook contribute to how the story and accompanying adventures are retained by readers. In addition, Potter’s use of subtext and symbolism to signify rebellion and independence interlace the tales with a density that has allowed the stories to stay relevant for years on end and further exploration of her literary prowess delves deeper into the impact they have had on the past generations and many more to come. 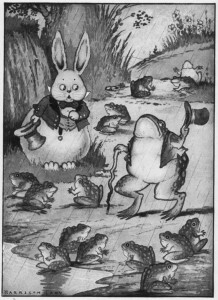 A major and defining technique implemented by Potter, anthropomorphism creates a connection with readers who view Peter Rabbit as a role model. “Scholars have noted that animals without clothing are less likely to be personified” and Potter’s use of color-coding Peter Rabbit’s sisters with red and Peter with blue gives them relatable personalities because they are making use of human constructs of clothing (Macdonald 185). Furthermore, Peter’s rebellious behavior when his mother forbids him from going into Mr. McGregor’s barn is indicative of the transitioning stages between childhood and adulthood, mimicking contemporary values of children testing their limitations within a world they are trying to understand. The rebellion aspect is actually inspired by Potter’s personal life fueled by “controlling and idiosyncratic Victorian parenting,” allowing her to add a timeless factor to her story because for as long as there are parents, there will be children to defy them to explore their own identities (Robertson et. al 177). As a young girl, Potter spent a lot of time with pets in her room whom she used to treat as “companions,” drawing, painting and creating worlds for these friends of hers (Robertson et. al 178). It only makes sense that these same qualities would so easily be understood by her large audience, who similarly have had pets throughout their lives who they treat as friends rather than as animals with little knowledge. By giving life to animals who behave like humans, moralistic values such as listening to one’s parents, taking care of oneself during times of danger, and learning from one’s mistakes become a learning and/or callback experience for readers. This way, they can live vicariously through the consequences of their characters and avoid putting themselves in similar situations. Peter Rabbit’s tale not only suffices this requirement, but it has a long lasting impact because of it uses animals to make an analogy about human lives. The Peter Rabbit Storybook Inside Pages 1. (c) Bess Goe Willis. Ryerson University Children’s Literature Archive. Public Domain. In regards to the human connection anthropomorphism makes, a complimenting factor Potter makes use of is the social commentary her plot points have. 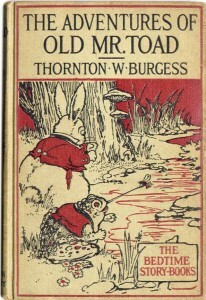 By focusing on simple storytelling with subtext, she creates a world that has a serene tone that mimics daily life experiences, such as making a mistake by eating too much and getting caught in a garden or being in the wrong place at the wrong time (although it is rare to be abducted to be given as a gift to a sibling) (Potter and Willis). Peter Rabbit himself is used as a character that is maximizing the potential of his youth, taking in as many adventures as he can. These range from sneaking onto private property, going fishing, being animal trafficked, and getting married while simultaneously hoodwinking hungry wolves in the process (Potter and Willis). 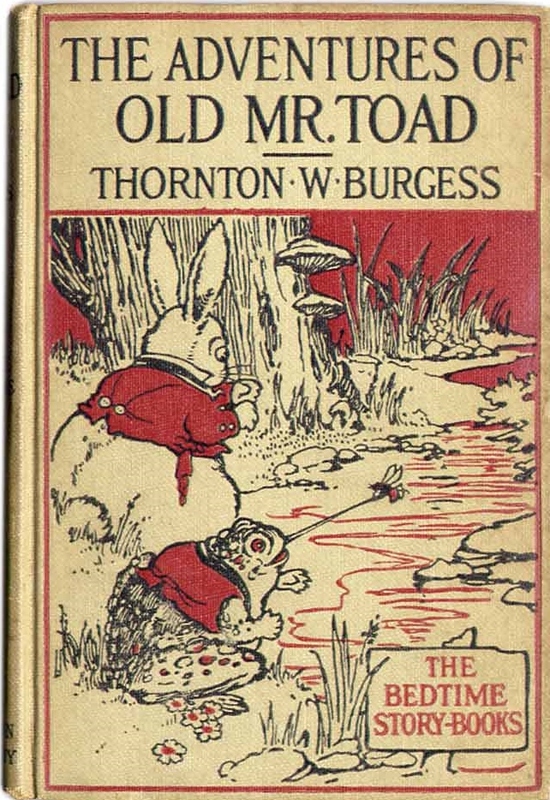 His “imperilled” and “daring” disposition makes him a versatile character, one that heightens readers’ curiosity in where an intrepid rabbit can take them on their journey through his otherwise idyllic world (Macdonald 186). In addition, we have his mother who is trying to keep his family together after the death of his father. 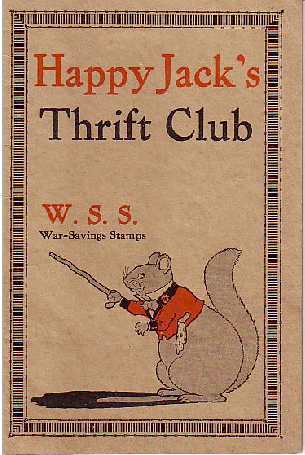 She is the widowed rabbit who is strict with Peter for losing his clothes because they have one less provider in the family, with Potter using her to comment on poverty in an attempt to bring a sense of realism to her world (Macdonald 186). We also have his sisters shown as law abiding, juxtaposing his disregard for authority with their youthful innocence. Taking the law into consideration, Potter uses her plot to take “the side of law and order” and teach her young and older readers about the importance of considering their actions from a logical point of view, rather than simply listening to everything their parents say (Mackey 6). Adorning this moral with the storyline of a rabbit’s journey through a garden of unknown, she creates a world that exists outside of the Rabbits’ home that adds to her story’s serenity. By focusing on a character/world study instead of complex plotting, she manages to expose her readers to a world that they would want to live in because of its simplicity and timelessness. This, in part, is helped by the format the story, and accompanying shorts, are presented within. 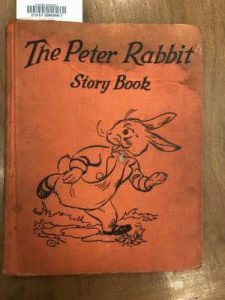 By making use of an 8 x 10 format for The Peter Rabbit Storybook, the book appears as a photograph album of a solid reddish-dark orange (Potter and Willis). The world that it holds becomes that of memories, nostalgic for old readers and memories in the making for new ones. How Madeline was horizontally longer to make use of the Eiffel tower as a background character throughout the story, The Peter Rabbit Storybook uses a square photo album format large enough to “comfortably accommodate a shared reading audience” (Lambert 5). The album feel is further noticeable with the presentation of each page’s pictures, with white borders similar to those surrounding camera photographs. The colors of the characters, while bright, have a faded layer to them, preventing the drawings from over-stimulating the reader. The art definitely contributes in setting the tone of the contemporarily halcyon feel that involves the ironically mischievous Peter Rabbit. “A square trim size is sometimes used to support thematic elements of a given picture book” and Peter Rabbit uses its format to show the world of nature that Potter has created for herself (Lambert 8). Based on the naturalistic styles of the character and surrounding descriptions, it becomes evident that she intends place her world “in no particular time, and yet in everytime” (Macdonald 185). While today’s world may be heavily influenced by the technology of our time, such as laptops, skyscrapers, etc., Potter makes it a mission to avoid using technological advances of her time and instead focusing on the countryside because of its perennial presence in all forms of societies. For as long as there have been cities, there have been untamed countryside areas longer and Potter makes use of the social concept of the nature that surrounds us for as long as there is human society. The main plot of the story is not even dependent on technology, but instead focuses on social agreements and the violation of said agreements (Macdonald 187). Basically, Potter uses human problems to fuel her stories rather than relying on contemporary McGuffins that would age poorly with time. By catapulting the story of a Rabbit into constant and recognizable setting, Peter Rabbit’s story is further immortalized in the hearts of its readers because it is less a period piece and more of an “ongoing” story (Macdonald 187). This further makes it similar to real world, especially seeing as how Potter’s intent is to have a “rabbit world as a complete and parallel one to the world of human” (Macdonald 186). 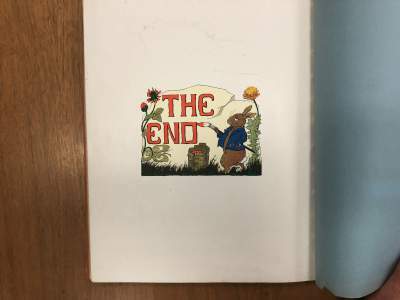 The Peter Rabbit Storybook The End. (c) Bess Goe Willis. 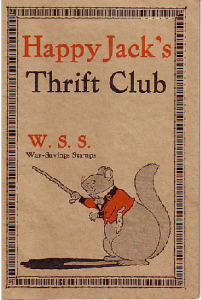 Ryerson University Children’s Literature Archive. Public Domain. By making use of all the literary resources available to her, Potter creates a cohesive world that makes use of analogies, multifaceted characters, simple and relatable plot points, and a natural setting to set the tone. Her use of anthropomorphism sets up the rabbit as a canvas for her own experiences of rebellion and freedom, which she uses to inspire her readers. Her use of easygoing characters and coming-of-age plot points ground her stories in a relatable sphere of any child or adult who has had to pay for giving in to their curiosity. Finally, the natural aspect of the stories prevent from the collection aging terribly, giving the tale and entire series a quaint, nostalgic and ethereal appeal instead. By amalgamating all these concepts, she has created a world that keeps on giving with bildungsroman stories about a rabbit that humans can and will continue to relate to for as long as nature stays relevant. Lambert, Megan Dowd. “That’s About the Size of It.” Reading Picture Books with Children: How to Shake up Storytime and Get Kids Talking about What They See, Charlesbridge, 2015, pp. 3–14. Macdonald, Ruth K. “Why This Is Still 1893: The Tale of Peter Rabbit and Beatrix Potter’s Manipulations of Time into Timelessness.” Children’s Literature Association Quarterly, vol. 10, no. 4, 1986, pp. 185–187., doi:10.1353/chq.0.0594. Mackey, Margaret. “Peter Rabbit: Potter’s Story.” The Case of Peter Rabbit: Changing Conditions of Literature for Children, Garland Publ., 1998, pp. 3–14. Potter, Beatrix, 1866-1943 and Willis, Bess Goe, The Peter Rabbit Story Book, New York: The Platt & Munk Co. Inc., 1931, Children’s Literature Archive. Robertson, Judith P., et al. “The Psychological Uses of Ruthlessness in a Children’s Fantasy Tale: Beatrix Potter and The Tale of Peter Rabbit.” Changing English, vol. 7, no. 2, 2000, pp. 177–189., doi:10.1080/13586840050137946.